Paul and I plan to attend the BMA Ministers Enrichment Weekend in Dayton, Virginia, this weekend. On Saturday morning (Jan. 31) I'm scheduled to have a book signing at the Kaffee Klatch at the Dayton Farmers Market, from 9 to 11 a.m. I'd be delighted if you stopped by. This is the story of two separate threads of my week coming together in the most bizarre way. Yesterday I sent a text to a number I had on my phone, thinking I was contacting Paul's niece. It led to the following conversation. Text from me: Is it ok if I know your amazing news?!?! Congratulations! Text from me: Huh indeed. Surely you are pregnant and it wasn't a false alarm. Text from me: Oh my word. I think my niece changed her number. Forget everything I said. Text to me: No problem. Ok, that was kind of embarrassing. But also amusing. So today I posted it on Facebook for all my friends to enjoy and to commiserate about the mis-sent messages of their lives. I've been back and forth via Facebook message with a lady named Elizabeth Witt who works at the Garden Way Retirement Community in Eugene. I'm scheduled to speak there next month, and she had sent me a tax-related form to fill out. "Hi Dorcas! Have you have a chance to fill put the W-9? Please send back a.s.a.p. so we can get in a request for your check. we are very excited to have you here next month"
"I just did it yesterday so will mail it today. My husband saw it and said, 'Why are you writing to a retirement center?" I said, "I'm putting our application in. You have to book a place way out ahead."" I went off to do something else and then I heard the Blip! of a message popping up. I came back and checked. It was from Elizabeth. She wrote. I have something EXTEMELY funny to tell you about your text"
I called immediately, wondering What in the World? Elizabeth said, "I had the weirdest thing happen just now." She had just finished her facebook conversation with me, then decided to read my page and see what was up in my life. She read the post about the mis-sent message and started laughing. She said, "So I'm laughing hysterically and hollering to the activities director and reading your post out loud, and the maintenance man walks in and says, 'Dorcas?? Did you say Dorcas? I got the strangest text from a Dorcas yesterday, wondering if I was pregnant.'" I had goose bumps up my arms by this point and was shaking my head in complete disbelief. And I was very curious what sort of guy this was. Probably a grandpa type, in his 60s. Elizabeth said, "He's a single guy in his 40's, a 'young' 40's, you know--an active kind of guy." Then she added, "I'll be sure to introduce you when you come next month." As Dave Barry used to say, "You can't make this stuff up." I had fun reading all the comments on the post about what sort of carryon I should buy. Thanks for all the input, experiences, and even links to cool bags. If I can weigh in on the carry-on question: I would say if you're taking a laptop, your only good option is something with wheels, because even a good backpack gets heavy fast with that much weight in it. 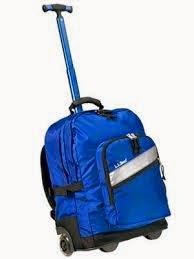 I'd say you should look for a good-quality rolling backpack--don't pull my old Mudd one out of the attic or pick up some ancient thing at a garage sale--that's small enough to fit under the seat in front of you. Oh, little Amy, you are so funny. My niece Annette and her husband Jay are the proud parents of a baby girl named Liberty Jubilee, the first Yoder great-granddaughter. Liberty has an older brother, Justice, who was adopted over two years ago. Annette and Jay know the pain of infertility and both children are miracles. I am one excited auntie...and I get to see them before long, after Paul and I go to Virginia for the BMA Ministers' Enrichment Weekend. And yes, there are lots of you that I'm looking forward to seeing at MEW, but my sister lives a mile up the road, so I might find it necessary to visit with her a few hours longer rather than listening to "Biblical Preaching: Examining, Explaining, Expounding the Word of God." I am wondering about Tupperware as a plot point in a novel. So when you wear the traditional white net head covering, it dents and squishes easily. Also, you can tell a lot by what size someone wears. And when you travel, you take your best one along so you're not napping in it in the van and rendering it all dented out of shape. So, the covering needs to travel in a proper container. We used to use ice cream buckets in our Beachy-Amish days, but Tupperware has so much more panache than a Land o Lakes bucket. And there's such a variety of sizes and such clever names. "Mom, no. Please," begged Sadie. "Not the ReMarkABowl! How embarrassing!" She set her battered suitcase down with a thud and watched painfully as her mother, Esther, nested all her daughters' church coverings inside her own and then stashed them inside the the large bowl normally used for potato salad on summer evenings. Placidly humming, Esther tucked all the strings safely inside and firmly pushed the lid on top. "Take this out to the van," she instructed, "and tell Dad to put it on top of the suitcases and not underneath. Connie should be here soon." "Oh Mom, couldn't you fit them into the biggest Wonderlier at least?" "Whatever for? Ach, get this stuff out there. And turn off the lights upstairs too." Sadie sighed and did as her mother asked. Just as she buckled her little brother into his carseat, her cousin Connie came speeding into the driveway and skidded her little Honda to a stop. She hopped out, looking trim and fashionable in a denim skirt and Aero sweatshirt, her hair in a messy bun with a bandana scarf. Then she reached in the back seat of her car for an athletic-looking bag and --was that a little yellow Seal-n-Serve?-yes it was. Unreal. Connie unzipped her bag and tossed it casually inside. Esther had shooed the last of the children out the door and come down the walk just as this scene unfolded, so she saw everything. She hoisted her large frame into the front seat and turned to Sadie. "Cheer up," she chuckled. "At least I didn't take the Fix-n-Mix!" On a more serious note, I am wondering: have you ever been pulled aside and told that you ought to rectify a certain behavior because people are talking? It happened to me once or twice, in my single days, when I still absorbed shame like Bounty soaks up spilled coffee. It didn't occur to me to say that if we have to change our ways because people are talking about us, then things are twisted about 15 ways away from righteousness. I heard the phrase again recently regarding someone else. "Do you know what's going on with 'Julius?'" someone asked me. "I'm hearing things about him, and I'm worried. And people at Shedd Mennonite are talking." It brought back that deep shame of being the talked about, and once again my mouth froze in place when it should have said, "And why in the world is this any business of yours or mine or theirs?" I wonder if this tactic is unique to traditional cultures like us Anabaptists. I suppose it happens in the royal family as well. And in big extended families in Yemen where you have to keep the family honor. All I know is that it makes me boil up inside like my stomach is full of baking soda and I just drank a bottle of vinegar. If someone has a problem, go talk to them. In a nice way. You know, like Jesus. "Hey Zacchaeus, good to see you. I'd like to honor you and be your friend." If "people" are "talking" to you, tell them you don't want to hear it. And don't use that vague phrase and all its ungodly implications as a threat. And if you're one of those people, then stop talking. And repent, lest a worse thing come unto thee. 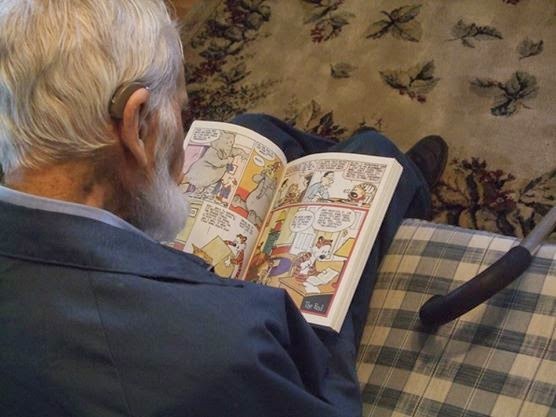 And on a happier note, if you're on Facebook, you might recall the picture I posted last summer when my dad discovered Calvin and Hobbes. When Matt was home, I found out that he had posted the picture on Reddit, a whole other universe on the web where people post things and discuss them to great lengths. And instead of facebook's "likes", you can up-vote or down-vote an entry. So Matt posted his grandpa's picture in a Calvin & Hobbes board, and also on a Awwww board. Each one got over 2000 upvotes. Grandpa has no clue of this, and never will, but it made me happy. 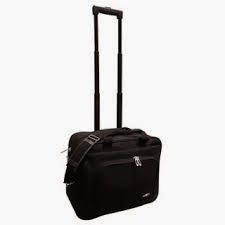 I have two trips coming up, and I need a carryon bag. 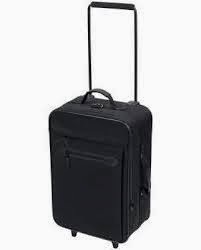 A good carryon, a perfect carryon, a nice carryon, that, if it rolls, does so smoothly, and if it is to be carried, does not make my one shoulder permanently two inches lower than the other before I get to the Made in Oregon store on Concourse C.
So I need advice. What sort of carryon do you like best? And why? 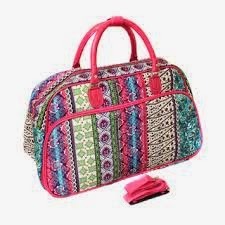 I almost always fly Southwest, as bags fly free, so I don't try to carry a week's clothing and dental floss in my carryon bag. I check my suitcases, which are usually 1/3 clothes for the trip and 2/3 walnuts for Dad or books for a signing, or, in this case, the triple crock pot arrangement that Steven got Matt for Christmas. And that didn't fit in his carryon. I have a smallish crossbody bag for things like my ID, earplugs, money, etc. If I fly, it's always a long-distance, all-day ordeal. No short hops and I'm there. Often the first leg is several hours to Phoenix or Denver, then a few hours of waiting, then another flight to Dulles or Minneapolis. And of course flying overseas takes three times as long. I like carryon bags that I can stick under the seat in front of me, since we vertically challenged people find it hard to hoist bags into the overhead bins, and I like to access my stuff en route. But that's not absolutely essential. At times I've used Paul's nice rolling computer bag. It's great for flat things like notebooks and computers, and bad for round things like teacups and bulky things like a blanket. Those miniature suitcases hold all my things but they're hard to slide under the seat or access en route. If that's what you use, do you prefer soft sides or hard? Two wheels or four? 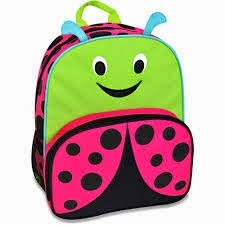 Do I want a backpack? A rolling backpack despite the housewife-returning-to-college look? Or one of those big Vera-Bradley-esque oversized purses? Or are they too heavy to haul around? 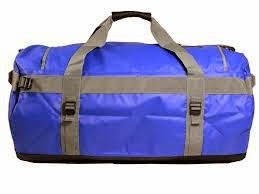 Or maybe a basic duffel bag? Or does your basic tote bag work best? 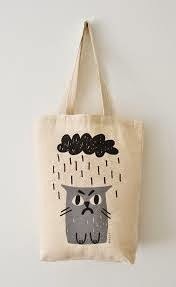 Some of them are really cute, such as this one featuring a cat who can sympathize with my SAD. Me: [reading a piece of paper lying near the computer] "Fire-Breathing Rubber Duckies??" Ben: It's the name of my design team. Not my idea, but some suggestions were rather perverted, so I preferred that. I used to hate football with a perfect hatred. An "I count them mine enemies" sort of hatred. I actually played flag football myself back when P.E. was required and my sadistic oblivious P.E. teachers thought this was a good idea but somehow never thought to set this Amish girl down and explain how the game worked. So I played it for six falls without understanding what a "down" was or what we were doing. Did I mention my intense hatred for this game? I also failed a written test on the subject, a black mark on an otherwise stellar high school career. Then I married a guy who liked sports of every kind. And later I had children who did also, and who loved the University of Oregon Ducks. In the gentle simmering soup of a loving family, I learned about football. I know about downs and extra points and touchdowns and fumbles. There's a lot I don't know, but I can listen to a game with the kids and enjoy it and understand enough to follow the general plot. Love and kindness make all the difference, people. And now there's Marcus Mariota, the Ducks' quarterback. In a world of college sports where there's way too much arrogance, entitlement, covering up of alleged crimes, and shady deals, Marcus stands out as humble, self-effacing, and consistently of upstanding character. And of excellence. So yes, that miserable little Amish girl, shuffling around on that high school football field hoping no one would expect anything out of her, she'll be following the national championship game on Monday. I don't know enough about the other team to make any sort of prediction about the outcome. But I do know I wish that, since they go to the same university, that Emily could, you know, kind of end up in a class or group with Marcus Mariota. Just as a mom, I kind of wish that. As do probably 5000 other moms out there. 2. Children coming and going. There's no way I want all of my six to live at home until they're 45. There comes a time when it isn't healthy. And once they're all out of the house I'll finally get to putter around making quilts all day. Except. . . I kind of want them to stay home forever. Matt and Amy were at home, and then they left. I think, weepily, "I know they're happy and fulfilled, but I just LIKE having them home." 3.Danger. I linked an article on Facebook about a guy from Idaho who was into extreme snowmobiling and accentuated the thrill by not taking any emergency precautions. I wondered about the ethics of this. Surely there's no justification for qualifying for the Darwin Awards. And a love of risk might be inherent, but it ought to be channeled into something constructive. The resulting conversation kind of divided itself into male/female lines, though not entirely. I've been happy, since then, to talk to people who are into outdoor adventures and other risky activities but also believe in emergency plans, responsibility, and sanity. Wondering: what are the ethics of pursuing danger for danger's sake? If you're into extreme sports, I'd like to know how you justify that level of danger-for-pleasure. Why not take a medical team in to Afghanistan where the Taliban might ambush you? Or work in an ebola clinic? Or trap pythons in the Everglades? Or, as I tell that one son of mine, "If you're that desperate for a thrill, I'd rather you smuggled Bibles into North Korea!" Sandra Miller I agree!! Makes me wonder if this principle is not like the one where Jesus was tempted to throw himself off the pinnacle of the temple..? Gertrude Miller Slabach Really. I mean, really! Audrey Stone McAninch And, he only got a scolding. Humph! Valerie Glenn Amen! That is the same advice we have given our sons. I thank God they listened. Hope Anne D Try adopting a special needs kid . . . . in my experience, Satan will throw so many curve balls at you that there is no end of excitement. Too much, in fact! And you will long for peaceful, boring days . . . But you will have given a child a chance at LIFE that they did not have. Renita Rhodes I totally agree Dorcas! We see this need for thrill more and more in young people ... may God use it for His kingdom! Julia Peachey Brubaker Amen, AMEN! I have been thinking this same thing for a long time! Why waste the energy of youth and risk life and limb on pointless pursuits that really don't benefit anyone else? I think our young people need more REAL challenges in life! Edie Kauffman-Landis I'd never thought of that perspective before, but I LOVE it! I've never had children but I watch my nieces, nephews and cousins' kids easily get 'bored' throughout the seasons of their lives, so I've often said to them, 'If you are bored, it's your own fault. There are far too many things to learn, too many people to help, too many books to read, too many things to do and build, too many places where they need good volunteers and you CAN be filling those places w/ your hearts and lives.' Perhaps the 'extreme sports and reality shows are simply selfish ways to fill those empty spaces in our lives where we are uncertain what to do or are seeking self-recognition, glorifying ourselves. sigh There are so many ways to circumvent God's plans and desires for our hearts and lives. Hope Anne D Just to clarify--My husband was along for both "rides" with our adoption journey's, which took us to "deepest Siberia" and into corruption laden Ukraine. He got plenty of adventure both times, so this was not a estrogen laden only form of adventure. Dorcas Smucker Shawn--thanks for your comment. I had a feeling my perspective might be flavored by estrogen, which is why I asked the original question. So, yes, I've read Wild at Heart, and when I was done I said Ooooooooohh I get it now. And when the boys were jumping off the back porch roof I didn't go all harpy female on them, but said, "Oh yeah, that's right, they're boys." HOWEVER. Surely even you have limits on the level of risk you will take. The guy in this article purposely didn't take any wilderness survival stuff. AND surely you would grant that you, being single and childless, would pursue more danger for its own sake now than you would that future day when you have a wifelet at home and a dependent kidlet or three. ALSO not to speak for God or anything, but surely he made that love of risk in men to have some sort of constructive use, such as spearing mammoths so the village could eat, rather than snowmobiling purely for the adrenaline rush? Yes, any sensible woman will let her guys be guys. But she would rather see them smuggling Bibles, as I said, than parachuting off the barn roof. Edie Kauffman-Landis Good thoughts, Dorcas Smucker. Rodney Troyer My thoughts on "extreme" sports is that most of them aren't actually all that dangerous. Thrilling? Yes. But life-threatening? No. Those guys doing back-flips on dirt bikes have done hours of practice into a foam pit. Also, risking an injured arm or leg is a lot different than risking your life. There are exceptions, of course (see free-soloing), but most of us who are adrenaline junkies aren't stupid. That said, you may be onto something with the "profitable" risk-taking. Dorcas Smucker I should maybe add that I got the Afghanistan example from real life. My sister's friend lost her 23? year old son when he accompanied a medical team and optometrist in to an isolated village and they were ambushed and killed. I would hate to lose a son for any reason, but I'd a thousand times rather lose him giving sight to the blind than free-soloing El Capitan in Yosemite. Cochinillo Dulce I am a woman and I take my adventures seriously. I have climbed and will keep rock-climbing, whitewater-kayaked Class III (and maybe 1 or 2 Class IV) waters, went on hot air balloon once and clipped a few of the top of the trees. I love the waters and have solo-SUP'ed waters a bunch of times. I have hiked and biked alone. Scouted camping in remote areas like the remotest section of Washington state called Makah Indian Reservation. There's a soon-to-happen plan to paraglide. Although these adventures seemed risky to anyone reading this, I have planned them with utmost care with safety reasons on top of the list. How so? I make sure my family knows where/what my plans are. I may be solo-adventuring but I make sure there are people surrounding me and the areas I go to. Never totally isolated. Cochinillo Dulce And oh, I'm not in my youth anymore either. Over the prime I would add. So this defies all notions of only men to take adventures to the highest risk. Or youth for that matter. Shawn Graber I appreciate your perspective, Dorcas. And I agree, there are bold risks that one could attempt in Jesus' name. But one does not simply go from sitting on the couch collecting stamps to smuggling bibles. Brother Andrew spent his childhood sneaking around at night disabling German tanks by pouring sugar into their fuel. To hamper a man's risk-taking nature by saying "is that activity entirely necessary? ", how would you expect him to grow up and risk anything at all? As for the snowmobile driver, no safety equipment could have prevented an avalanche. Hindsight is especially clear. Do you have emergency survival equipment in your minivan? Something that encouraged me is that even with broken bones and a bleak outlook, his thoughts were not on himself but on his family; an uncharacteristic trait of many men in this generation. Dorcas Smucker Well, Shawn, obviously this is not a cut and dried moral issue so each of us has to figure out the level of risk we're willing to take, and for what reasons. I just sent the amazing daughter Amy back to Thailand where she will again zip around the big city on her motorbike, a risky business by any gauge. I asked her what she did as a child that prepared her for this. She didn't know. In general, she wasn't afraid of anything but didn't seek out thrills for their own sake. Dorcas Smucker As for emergency survival equipment, no, I don't carry it, but I used to when we lived in the Wild North of Canada, where help might be a hundred miles and half a day away. Maybe that's where Amy learned to be ok with danger for Jesus. Dorcas Smucker And one more thing...I think I have something of an Amish perspective on this, in which risk for the good of the group is a good thing and risk for your own enjoyment isn't. Again, not a precise moral line but it certainly flavors my perspective, in addition to all the estrogen. Dorcas Smucker Jamie Pyles--I found Wild at Heart to be kind of a bizarre book, but I kept one nugget from it, and that was to relax about [at least some of] the wildness in the guys in my life. 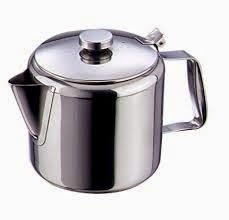 And Paul's urge to jostle the jiggler on the pressure cooker. Avis Blowers I totally agree with your perspective of this issue! Zonya Gingrich Good thoughts here. Dorcas Smucker And Cochinillo, you're right that it's not a clear male-female difference. In this family, the boys took the most risks in general but the girls were never afraid of much, and Jenny was always climbing up on the highest roof she could find. Rebecca Barbo Dorcas, I am very intrigued by your question, the article and the thread. Some very good thoughts. It seems to me that the capacity and enjoyment of risk is a God given gift. Many are very content without risk in their lives. So maybe the trick, as parents, is to encourage that risk taking child to pursue a career that uses that gift and brings God glory, as you suggested. Having raised my children in a risk-taking environment, they are more comfortable with risk than most, hence one child going off on his own to Turkey for 2 years. But one of my children (Keith Allister Barbo, you will find this thread interesting!) has an inborn capacity and hunger for risk that was obvious within months of birth. He will be the one at 54 snowmobiling off of cliff edges if he has not found more constructive ways of using his gift by then. I sure hope Mr. Crazy Snowmobiler has a career as a prison guard, or search and rescue, or catching pythons as you said. So a question, Is risk taking a muscle that we try to build up in our children or a fault we try to suppress?? Christine Weaver The issue I have w/ extreme sports is that they expect to be rescued by a (usually volunteer) squad who leave their family and endanger THEIR lives to save said thrill seeker. Rodney Troyer I always said that unless you're living on the edge, you're taking up too much space! Miriam Iwashige If a "child" is under 25 years of age, I think the adults in their lives need to weigh in with appropriate cautions, given the fact that the brain is not fully developed till after the age of 25. I personally have a lot of openness to risk-taking in the interest of accomplishing a great "good," but very low tolerance for what seems to me to be selfish thrill-seeking. The two-year-old child of mine who climbed up very high on the windmill ladder grew up to go to the "ends of the earth" in order to accomplish a great good in a needy and hazardous place. Maybe it's helpful to think of adults as needing to restrain their children at times to prevent risky behavior, but usually it's not necessary to dole out punishment for risky behavior. Carolyn Schrock Miller Loving the thoughtful responses to this. Having two sons who love risk has pushed me into some new territory and many discussions with my husband who is very much on Shawn Grabers page. Luci Martin My calm, strong husband says a hearty amen to your initial statement, Dorcas. Dorcas Smucker Rebecca--thanks for weighing in. I'd like to hear more about your muscle to exercise vs. fault to suppress question, especially regarding that one son. I think those of us with sons who love risk even more than most learn to be a little more chill than other moms. When Steven applied for firefighter training, a woman asked me, "Aren't you afraid for his safety?" It actually hadn't crossed my mind. I was just so happy to see him doing something constructive with his natural "gift." Valerie Glenn Raising six sons I have had many opportunities to exercise the balance between mom's comfort level and a male's desire for adventure!! It is a God given drive, I believe . But one ,like any other, that must be utilized for good not simply for self.and thrills. There are times when we have stood back and let them do something risky they felt strongly they needed to do too push themselves to their limits or whatever but overall we have encouraged them to find an outlet for that that is for a bigger purpose than themselves. Did they need to experiment in taking risks in order to be able to do the extreme risk taking work they have done now? No, I don' think so. Rather it was.acknowledging that, within them, is right and good and therefore encouraged when channeled constructively. Most any healthy young male does not need to experiment with crazy in order to do very well living out a life on the edge for God. Dorcas Smucker Thanks for sharing, Valerie. With how many boys you have, their personalities, and what they're up to now, you have the credibility and we should listen. Alta Peachey I thought of your post when I read about this doctor in the newspaper this morning. 4. Why is it that, when someone comes up with a new idea, Smuckers in general tend to loudly and immediately say all the reasons it won't work? "No breakthrough ideas will ever come out of this family," said a family member with a sigh. I'm told, to my chagrin, that I do this too, contrary to my holier-than-thou insistence that I am always supportive and encouraging. How do we change this, I wonder. Because we need to. "I finally figured out what ideas are like in our family. They're like clay pigeons."